You already know that using solar and wind power can influence the climate by reducing our dependence on heat-trapping fossil fuels. Now scientists say these renewable forms of energy can change the climate more directly — and do it in ways that might surprise you. If wind turbines and solar panels were deployed across the Sahara, more rain would fall and more plants would grow in the massive African desert, according to research published in Friday’s edition of the journal Science. “Renewable energy can have multiple benefits for climate and sustainable development,” wrote a team led by researchers from the University of Maryland’s Department of Atmospheric and Oceanic Science. To figure this out, the researchers imagined three scenarios for the Sahara and the Sahel, a semi-arid region immediately to the south. Once their hypothetical energy farms were built, the researchers fed the details into a sophisticated computer program that simulates Earth’s dynamic climate. Then the program made predictions about how the farms would change the environment. In the case of wind farms, the giant turbines would cause warmer air from above to mix with cooler air below, bringing more heat close to the surface. Air temperatures near the ground would increase by nearly 4 degrees Fahrenheit. In addition, the turbines would interrupt the smoothness of the desert surface. Winds blowing through the area would move more slowly. That, combined with the added heat, would change the atmospheric conditions over the Sahara and bring more moisture to the area. Average rainfall would increase by up to 0.25 of a millimeter per day — about double what it would have been otherwise, according to the study. The additional water would fuel plant growth, and those extra plants would reduce the amount of sunlight that’s reflected off the desert surface. From there, it’s a positive feedback loop, the researchers explained: The reduced reflectivity (or surface albedo) enhances precipitation, which fuels plant growth, which reduces albedo, and so on. The story is a little different for solar farms. Instead of slowing the wind or causing hot and cool air to mix, the main effect of solar panels is to reduce albedo. That would increase average daily precipitation by about 0.13 of a millimeter in the Sahara and 0.59 of a millimeter in the Sahel. The additional water would induce more plant growth, further reducing albedo and allowing the cycle to continue. These changes were predicted to increase the maximum temperature by more than 2 degrees Fahrenheit, the researchers reported. If wind and solar farms were combined, these effects would be “enhanced,” they said. Average daily precipitation would increase to 0.59 of a millimeter. That’s nearly 1.5 times higher than the Sahara would be in its natural state. But the rain wouldn’t be spread evenly everywhere. The computer simulations predicted that parts of the Sahel could get as much as nearly 20 inches of additional precipitation per year. All that extra water could have “major ecological, environmental, and societal impacts,” Li and his colleagues wrote. Average temperature would also rise, by nearly 5 degrees Fahrenheit. Changes like these wouldn’t necessarily happen everywhere solar farms are built, the researchers cautioned. 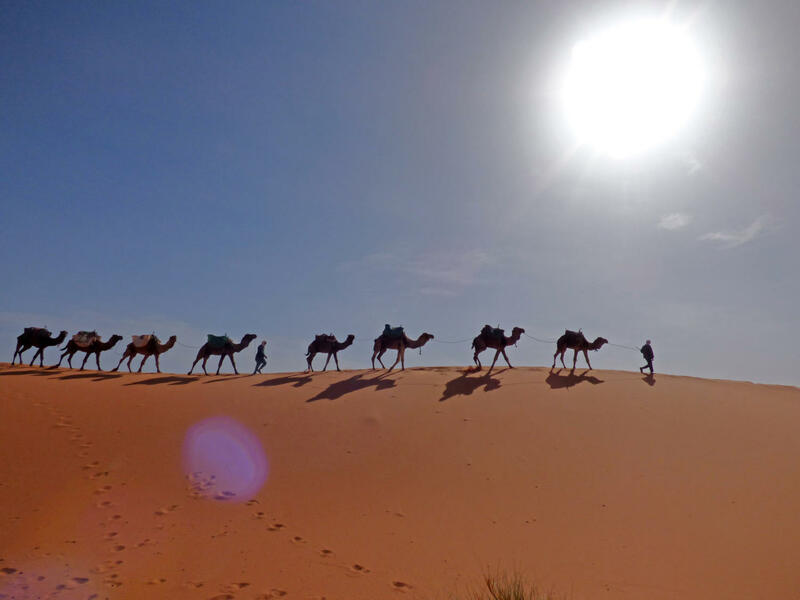 In the Sahara, the key is that today’s typical solar panels would increase the surface albedo. But if the landscape were different, that might not be true. Ditto if the solar panels were more efficient — that could cause temperatures to fall instead of rise. Without added heat, rainfall wouldn’t increase. It might even decrease, the researchers noted. These are all factors to consider when building a wind or solar farm, they wrote. If placed just so, these power plants could generate more rain and plants in addition to more clean energy.